The link below is a table detailing the FDA approved anthelmintics. Not all of the anthelmintics listed are labeled for sheep. Check the FDA approved species column (4th from left) to make sure it is safe to use with sheep. Have a small-flock drencher on hand for those times when you only need to worm a few animals. Are parasites a limiting factor in your flock? 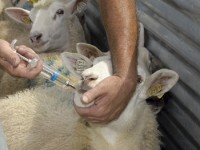 The parasites that infest sheep can be an enormous drag on sheep production. Year in and year out, they probably cause more death and disease in some producers’ lamb crops than any other single factor, including predators. 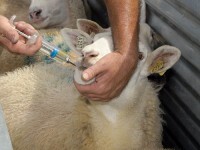 A link to a British educational review of on sheep de-worming issues and practices. It includes information on peak infection times, when and when not to de-worm and how it should be done. We’ve included it because it makes a complicated subject unusually easy to read and understand. There are two main styles of chutes used for handling sheep—the treatment chute and the sorting chute. Handling setups for larger flocks (500+) often have both types of chutes. Smaller flocks do their treatment within the sorting chute.